Of Course, Serena Williams Was Fined $17,000. Of Course. Yesterday, after Serena Williams defended her opponent, Naomi Osaka, against a torrent of boos following Osaka’s controversial win, Dictionary.com used the moment to exemplify “grace” on its Twitter account. 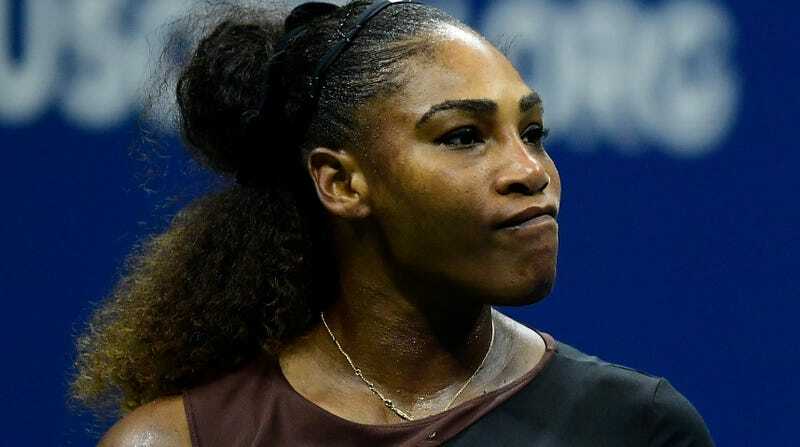 Well, if the dictionary wanted to define the phrase “adding insult to injury,” it could certainly use the U.S. Tennis’ Association’s decision to fine Williams $17,000 for three code violations as an example. As the Associated Press reports, the tournament referee’s office penalized Williams $10,000 for “verbal abuse” of chair umpire Carlos Ramos, who doled out penalties to Williams for allegedly receiving coaching and for breaking her racket. The coaching charge cost Williams an additional $4,000; breaking her racket, another $3,000. The fines are themselves just a dent in Williams’ second-place purse, which totals $1.85 million. But the circumstances of those penalties give them extra weight. The first, the charge of receiving coaching, was refuted by Williams at the time and later, by her coach Patrick Mouratoglou. While Mouratoglou acknowledged he had been attempting to coach Williams, he also said she hadn’t seen his signals. Mouratoglou also brought up Rafael Nadal, whose match Ramos officiated earlier. “(His uncle) Toni’s coaching every single point and [Ramos] never gave a warning, so I don’t really get it,” Mouratoglou. Riled up by the call, Williams received another warning for smashing her racket. As Deadspin reports, Williams didn’t appear to notice she got that penalty, and was demanding an apology from Ramos. “I have never cheated in my life. I have a daughter and I stand for what’s right for her. I’ve never cheated, and you owe me an apology. You will never do another one of my matches,” Williams told the ump. In response, Ramos docked Williams a full game. During the second set. Of the U.S. Open. So there you have it folks, the word “thief”—in a cruel twist of irony—is a word that will cost you $10,000. If you’re Serena Williams, that is.